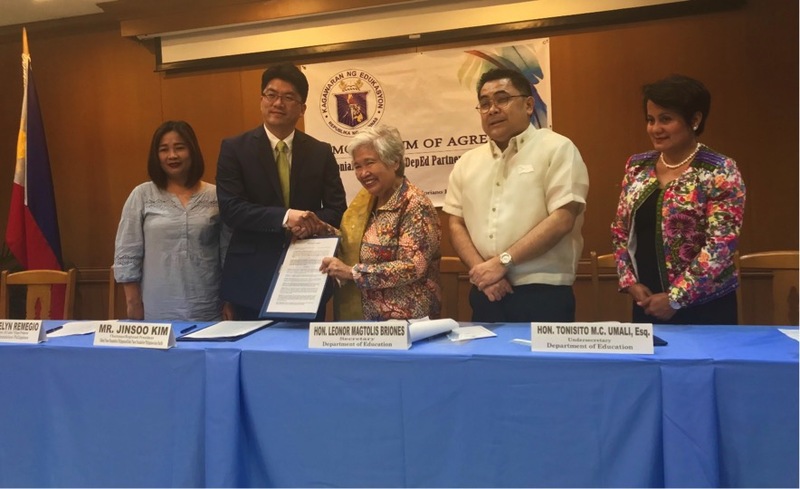 Global Peace Foundation (GPF) Philippines reaffirmed its partnership with the Department of Education (DepEd) in delivering better quality education to public schools in the country, particularly in poverty-stricken communities. The undertaking is strengthened with the signing of Memorandum of Agreement between the Department of Education represented by its Secretary, Hon. Leonor Magtolis-Briones, and GPF Philippines, represented by Jinsoo Kim, Regional Representative for Asia Pacific. 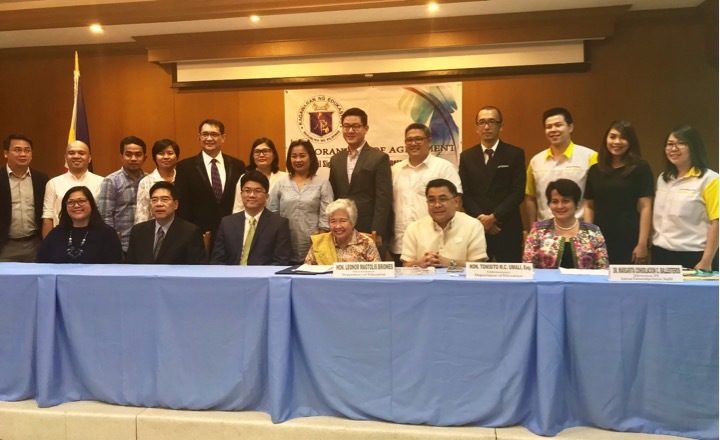 The signing took place on November 27 at the Southeast Asian Ministers of Education Organization (SEAMEO) Regional Center for Educational Innovation and Technology (INNOTECH) in Quezon City. Through the “Adopt a School Program,” the Department of Education encouraged private companies and organizations to assist in developing the Philippines’ public education system by improving the teaching and learning process and experience in schools across the country. GPF Philippines was among the organizations who responded to the call of DepEd for private sector participation in public education by partnering its programs and initiatives such as the All-Lights Village Project, GlobALS, Character and Creativity Initiative, and Global Peace Volunteers Camp. These programs and initiatives by GPF aim to advance not only the literacy skills among its beneficiaries, but also develop soft skills and competencies needed by students and educators to become ready for the future and contribute positive impact to their society. To date, GPF Philippines, through its Alternative Learning System initiative GlobALS, has benefitted more than 3,000 learners in 60 All-Lights Village communities and GlobALS learning sites which are mostly underserved. Also present at the signing were representatives from the private sector who likewise responded to DepEd’s call to become a Philippine education development partner such as Colgate-Palmolive Philippines, Epson Philippines, Lamoiyan Corporation, Mariwasa Ceramics, Mondelez Philippines, Philippine Business for Social Progress, Quipper Limited, and Smart Communications. Read more from the Philippines Department of Education. Subscribe to Global Peace Foundation newsletters to keep up on all the latest.